Brett is acting in Mat Smart [Naperville]’s new comedy as a part of Rule of 7×7: Spring Edition. 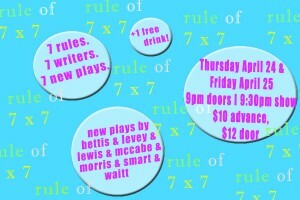 Brett produces this fun & killer & semi-outrageous event which invites 7 writers to create 7 new plays each based on the same 7 rules. In honor of playwright Dan McCabe’s rule ‘flashback,’ here is our promo video featuring flashbacks to RULE OFs past!